Sean Kelly Gallery and i8 Gallery are delighted to announce two exhibitions, featuring Anthony McCall and Finnbogi Pétursson, being held concurrently in New York and Reykjavík, Iceland. The opening in Reykjavík will take place on Friday, June 19, from 5pm to 7pm at i8 Gallery; the opening in New York will take place on Thursday, June 25, from 6pm to 8pm at Sean Kelly Gallery. Both artists will be present at the openings. Anthony McCall will present Doubling Back, 2003, at the Kartöflugeymslur, an old war bunker, positioned on the outskirts of the city. This projected light piece stretches from the floor almost to the ceiling and, over a period of thirty minutes, two intersecting curved lines create planes in space that gradually move toward and away from each other. The installation examines drawing, volume, space and time, as well as how viewers engage with each other and the physical realms of an artwork. At i8 Gallery, McCall will present a group of early works from the 1970's, including performance scores, films, installation drawings and photographs. McCall first presented a performance work in Iceland in 1972, along with members of the SUM collective (many of whom currently work with i8 Gallery), at the Gallery SUM during the Reykjavík Arts Festival; SUM was a group of Icelandic artists who ran their own gallery in Reykjavík from 1968 to 1976. Finnbogi Pétursson will present new installations in the lower gallery at i8. Engraved into the gallery wall, an actual sound recording from an Icelandic glacier materializes as a 'sound-image'. 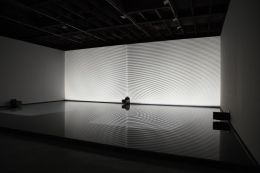 Another site-specific work consists of a small-scale water installation where the conjunction of light, water and rhythm create an interplay of shadows and sound caused by the passing of time. Anthony McCall will present three vertical 'solid-light' works - Coupling, 2009, Breath III, 2005 and Meeting You Halfway, 2009 - each of which is being shown in the United States for the first time. The works will be exhibited quarter-scale, in maquette form, projected from the ceiling onto pedestals. 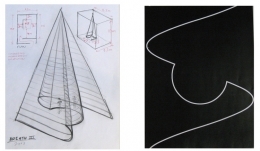 As a group, the vertical projected works continue McCall's exploration of sculptural form, durational structure, and the possibility of representing the corporeal, which began in 1973 with his seminal film, Line Describing a Cone. Finnbogi Pétursson will present Earth, 1994-2009, a transfixing installation that utilizes sound, light and shadow. 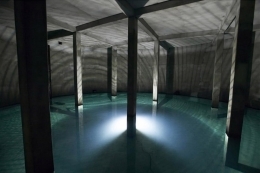 Pétursson will flood the main gallery, employing low frequency sound to continually move the water. The reflections radiating from the piece form an ever-changing environment in the gallery, creating a deeply compelling installation. 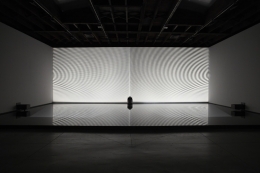 In an additional work, Dream, 2004 – installed in Gallery One - Pétursson channels low frequency sound through a large, clear bowl of water, creating reverberations on the water's surface. Light projected from beneath the bowl onto the ceiling, creates luminous undulating patterns. As the sound changes, the patterns of the projection fluctuate and evolve. 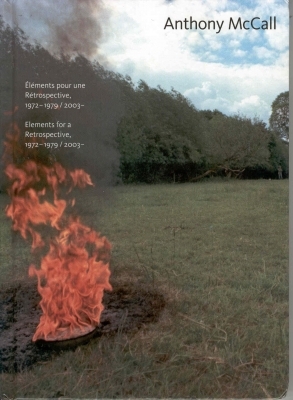 Pétursson says: "I am always trying to capture phenomena, such as sound, water, fire, shadow and light, and channel them along new grooves, turn them into something other than what they are. These are phenomena that you feel and think about, but never see." 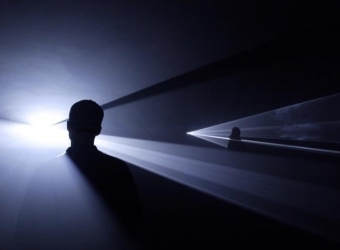 Anthony McCall is one of the seminal artists of American avant-garde cinema. His films and installations take as their starting point the irreducible, necessary conditions of cinema: projected light and real, three-dimensional space. McCall's work is included in many major public collections worldwide including: the Tate Gallery, London; the Museum of Modern Art, New York; the Whitney Museum of American Art, New York; the Musée National d'Art Moderne, Paris; Centre Georges Pompidou, Paris; the Museu d'Art Contemporani de Barcelona; and the Museum für Moderne Kunst, Frankfurt. 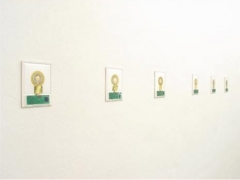 Finnbogi Pétursson has been exhibiting since 1980 and is one of Iceland's most prominent artists. He is known for works that fuse sound, sculpture, architecture and drawings. 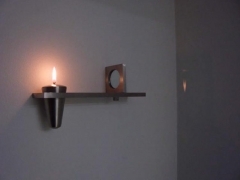 Sound, a crucial element, is typically incorporated into spare sculptural installations. Pétursson represented Iceland at the Venice Biennial in 2001 with his monumental sound installation Diabolus. Collections include T-B A21, Vienna; Malmo KunstMuseum, Sweden; Nordiska Akvarell Museum, Sweden; and the National Gallery of Iceland. Permanent installations are at Landsvirkjun, Vatnsfellsvirkjun (an electric power plant) and the Reykjavík Energy Headquarters. In addition to these exhibitions, Creative Time will exhibit Anthony McCall's two-projector vertical work, Between You and I, 2006 in the exhibition PLOT09: This World & Nearer Ones on Governor's Island in New York City, opening June 27. Please check information at www.i8.is for opening hours at the Kartöflugeymslur in Ártúnsholt to view Anthony McCall's installation of Doubling Back. *Each work is shown here at quarter scale. Price excludes equipment.